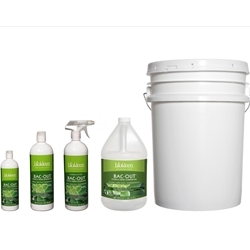 CONTAINS NO: Chlorine, ammonia, butyl, glycol ether, SLES, DEA., EPA priority pollutants. No materials listed by the ACGIH as hazardous. I have pets and find this product works well on most pet stains and odors. I have used this for several years now and am extremely happy with results. I use it in the kitchen, bathroom, to shampoo carpets, scrub floors, toilets, bathtubs and sinks. Use it in my laundry as needed with and without regular laundry soap. I usually keep 2-3 bottles on hand so i don't run out. I LOVE this stuff. I also use biokleen laundry detergent, dish soap and sometimes their product specific items. Great company. Great products.